We appreciate your feedback about your support experience with Lucas Stark, developers of WooCommerce Wishlists. This helps us maintain high standards on the WooMarketplace, and helps Lucas Stark improve. WooCommerce Wishlists allows guests and customers to create and add products to an unlimited number of Wishlists. From birthdays to weddings and everything in between, WooCommerce Wishlists are a welcome addition to any WooCommerce store. Studies have shown that allowing your customers to save and manage their own Wishlist can increase your sales and conversions. What better way to encourage customers to return to your site than allowing them to save items for later, or create their own dream list of products for that special occasion? In addition, allowing your customers to share their lists with friends and family through various social media networks truly opens the doors to potential new customers and visitors. Allow Guest customers to create their own Wishlists which will be stored for a maximum of 30 days or until they clear their cookies. Allow Registered customers to create Wishlists and store them indefinitely. Unlimited numbers of Wishlists can be created by customers. Whether it is one list for that special occasion, or a few personal lists and a few shared lists, the possibilities are endless. Full privacy control over lists. Customers can assign their Wishlists as public (anyone can search and find their list), shared (only someone with the unique URL can view), or private (only they can view it). Social media sharing. Guests and Users alike are able to share their public or shared lists through Facebook, Twitter, Pinterest, and even Email with a custom email message. Full support for grouped products, product variations, and of course, simple products. WooCommerce Wishlists also supports products using the Product Add-ons extension and theGravity Forms Add-on exstension. While browsing products in your shop, customers will be notified if the item already exists in one of their Wishlists and will be told which one/s. From the single product screen, customers are able to add a product to an existing list, or create a new list for the product. The “Add to Wishlist” text is fully customizable and can be changed from a buttton, to link text with a star or present icon. For the designers out there, you could even create and add your own icon. A custom WooCommerce settings tab to adjust many of the core functions. A robust admin section to view and manage created wishlists. Since WooCommerce Wishlists generates specific pages, there is extremely easy integration with WordPress Menus so you can add a link to any menu your theme supports! Managing a Wishlist has never been easier. Numerous Bulk Actions are available to easily: Add multiple or all items to the cart, delete one or multiple items in an instant, update quantities for one or multiple items, and even move one or multiple items easily to another list or to a brand new list. Front-end Wishlist Settings for your shop customers. 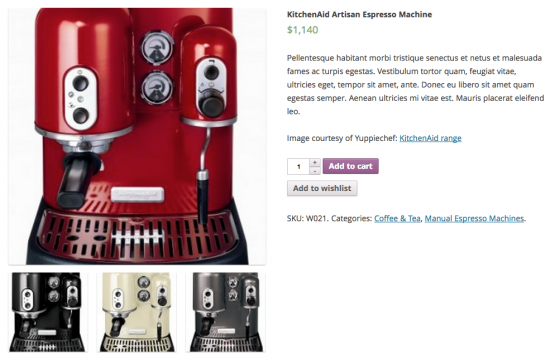 Easily edit and adjust core settings through Wishlist’s own custom WooCommerce settings tab. 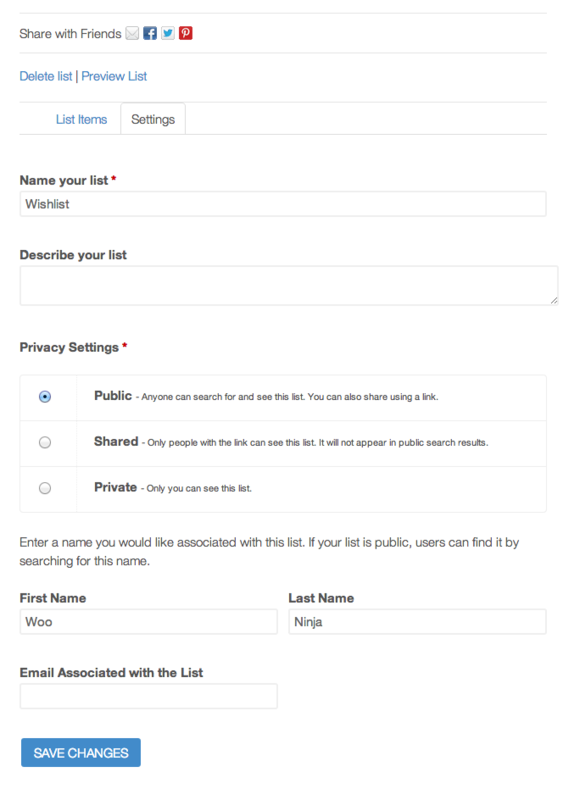 Whether it is customizing a message, button appearance and colors; to allowing sharing of Wishlists through Facebook, Twitter, Pinterest and email, WooCommerce Wishlists has you covered. WooCommerce Wishlists will inherit your current themes styles for buttons and other elements, but if you’re a designer or developer wanting to make some magic happen, it’s easily done! You can effortlessly add any custom CSS you would like to adjust WooCommerce Wishlists appearance to match your custom theme or design. As a shop manager, you might sometimes want to monitor Wishlists that have been created to get an idea of what your customers are really wanting. From the administration screen, you can view and sort Wishlists from a variety of options, and even edit Wishlists directly from the backend.